We were in the mood for something a little bit cute today, and I was also really craving egg salad. How to fix both problems? 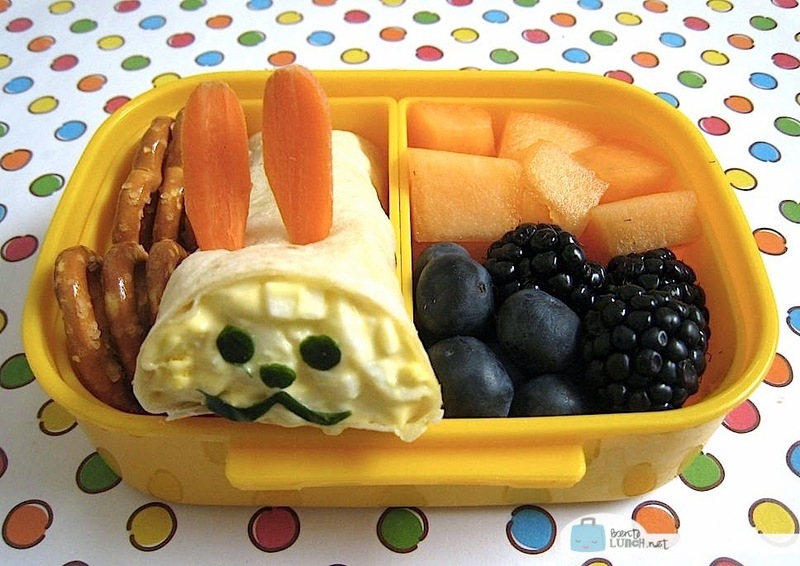 Bunny wraps! They are just a simple egg salad, wrapped in a tortilla, and decorated with cucumber faces and carrot ears. For the carrot ears, slice thin pieces of baby carrot (I actually trimmed one end to a triangle) and use a really sharp knife to make two slits in the top of your tortilla roll. The ears slide right into place. Ben has a bunny wrap, a few pretzels, cantaloupe, blackberries and blueberries. The wrap actually slid right into the box after the picture, I just had to show off his cute face first! HAHA! That one made me laugh out loud. Too funny! Aww cute bunny!!! Love it! A cute one! haha.. its kind of amazing that you can keep the egg salad from oozing out..
Super cute!!! another great idea! !